What a full and fun day! 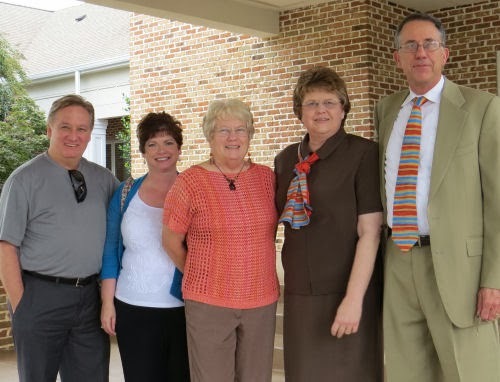 Started with worship at Woodmont Baptist Church, where Loretta attended when she lived here. 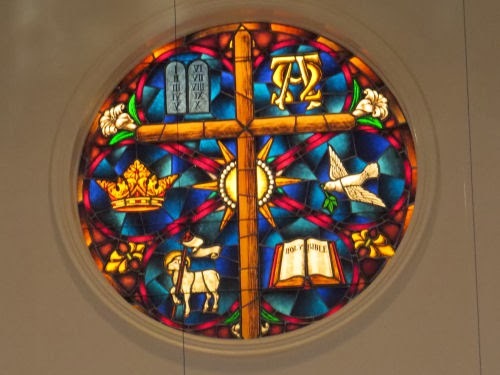 I loved this window. After church, friends of Loretta's took us out to eat at a fantastic buffet. I attempted to be moderate in my choices, but still ended up w-a-a-a-a-y too full. (Randy, Annette, Loretta, Nancy, Bill) Bill and I got talking about Environmental Chemistry and testing stuff, which was good, because I just don't know any of the people the others were chatting about. 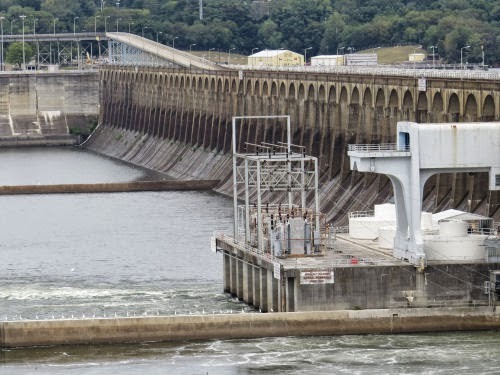 Then, Bill and Nancy took us over to Wilson Dam, built in the 1910s when it was discovered that Alabama could process nitrite to make gunpowder for WWI. 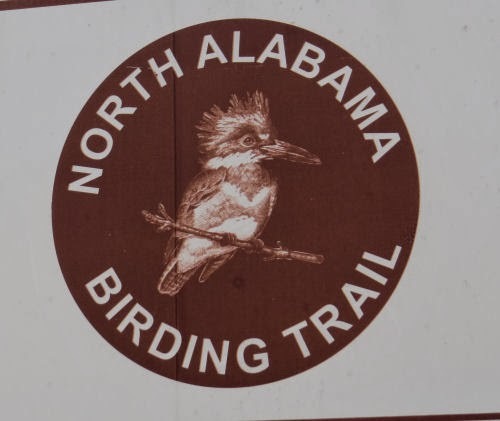 There are also foot trails, and several sites on the Alabama Birding Trail. Turns out Bill's an avid bird watcher, as well. Wilson Lake is above the dam and Pickwick Lake below the dam (created by the next dam down the Tennessee River). I had to include this picture, just to prove I'm really in Alabama! The best of all was in the evening, with the church's annual Singin' with the Saints concert. This was their 10th anniversary, and they did the favorite songs from previous years. And, by the way, Loretta sings well enough that she was invited to jump right back in and sing in the concert, which she did! An album of pix on Facebook if you want to see more. Loretta and I are in ____________? 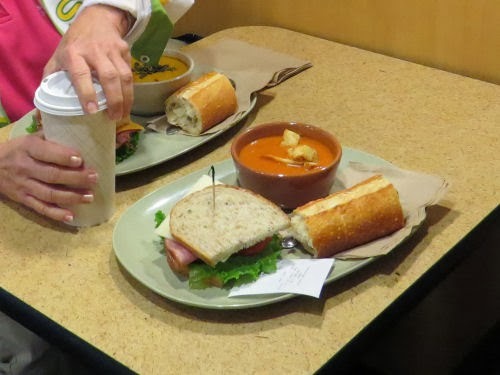 Will these pictures help you out? No? 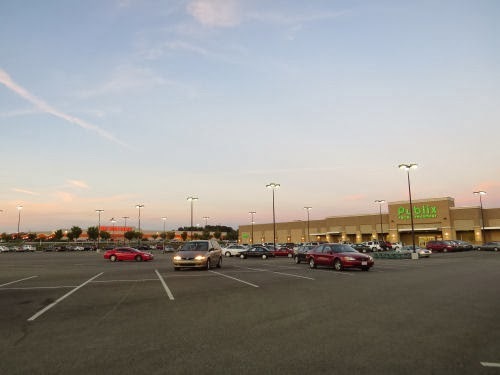 This is the part of America I hate- where every town looks just like all the others. Well, we finally made it to her friends' house, and we are crashing for the night. Oh? you want a better clue? We are in a state that starts with A.
I guess this is the week of pretty things in not my favorite colors. I was all set to bring you another silo lesson, but hey... then I was at a house with this beautiful hydrangea, with the leaves beginning to turn color. The silo can wait. Pink is at the very, very bottom of my color list. For me to admit that I think something pink is pretty means it was REALLY pretty, and pink just happened to be involved. 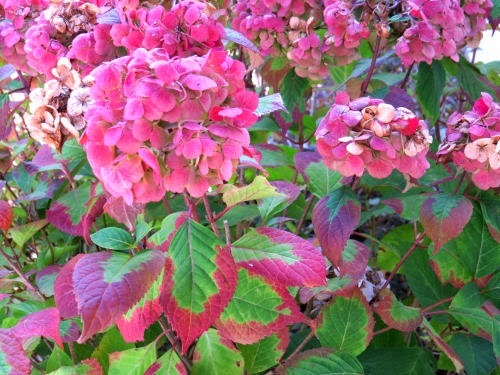 So, here's a late-season hydrangea to brighten your day. Tomorrow night I'll be in another state. Maybe I'll be able to blog- hope so! You can guess which one until then. I've shown you these before, done a plant ID and all that. This time, it's just to make you smile. They always make me smile, even if they are purple. It's always nice to have some things blooming in the fall. 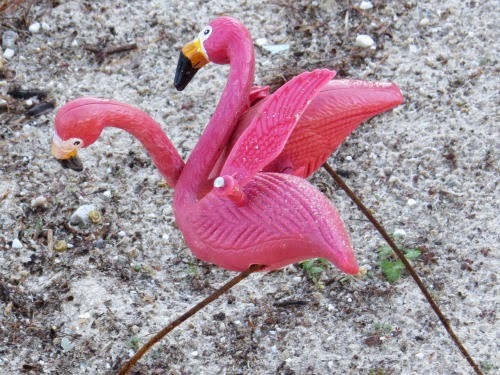 Down on the beach... a late summer fling. Gerald and Heloise necking. Oh! "Well, this is certainly a shock. Heloise, how could you? You can call my lawyer, I'm filing for divorce in the morning." 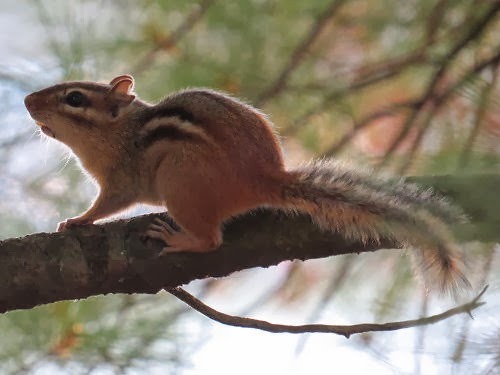 The cutest thing today by far- a wary little chipmunk with a pine seed in his mouth. He held still for me to take his picture-- I think because he was afraid I would steal his prize and he thought if he was motionless I might not see him. Guess he doesn't understand about backlighting and silhouettes. You know I love wetland plants, right? 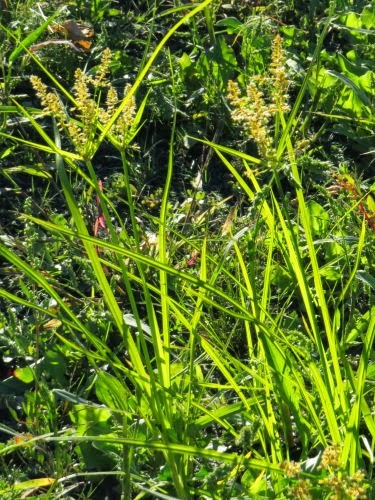 There are two large groups of sedges, the Carex, with hundreds of species, and Cyperus with a good number, but not hundreds. I won't trouble you with the differences tonight. I have to get to bed. Just enjoy the flowering of a plant hardly anyone notices, and if they do, they call it a weed. 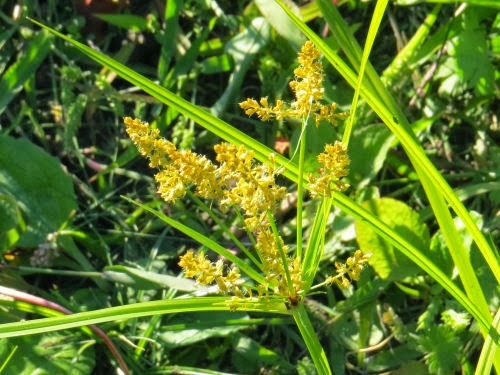 I have no idea which particular Cyperus this is. I'd need to bring home one of the plants and key it out. The differences are technical except for a few easy ones. I went for a walk today, just before sunset. I know it's only one day farther along on the calendar, but with the rain the past two days I didn't do much outside, and suddenly, today things just looked like fall. 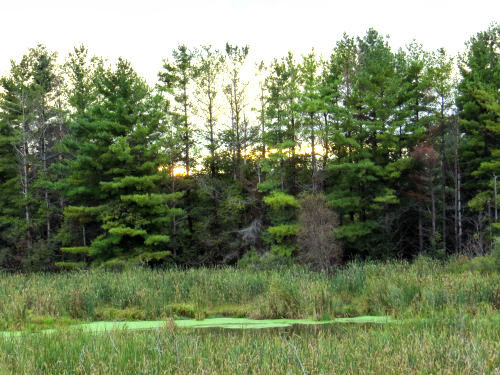 The greens are faded, the ends of the cattails are brown. There's a small pond in the center, now filled with duckweed- a green smudge. 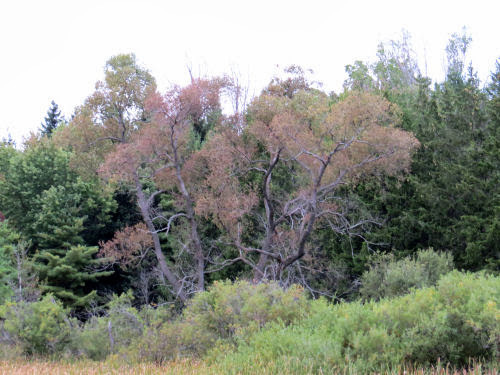 Some trees have fading, thinning hair- they're getting old like the rest of us. This is a road loop I do when I just want the exercise, and don't have time to drive to some trail. 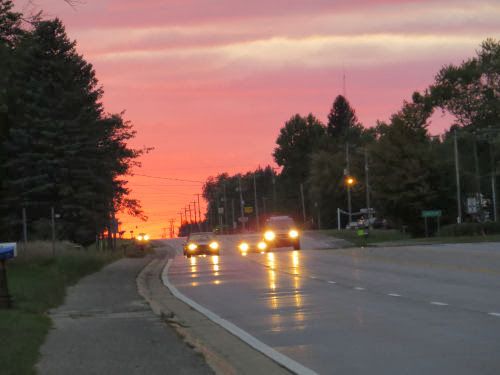 As I rounded the last corner for home, the sun was setting down the western road. Somehow it made me think of Jim Croce's "I've got a name." Here's just one little piece. Do you remember that song? Word order matters in English. "The quality in today is nothing" is not the same thing as "nothing in today is quality." Finally, this week I got to sleep as long as I wanted (needed?) after a night of work. I got up. I ate something. I sat in my chair and read blogs and did some computer stuff. I played games. I sat in the dark and the quiet, listening to the rain. I have needed a day like this for quite a while. For a visual, I'll leave you with a picture of a family treasure (only to me). 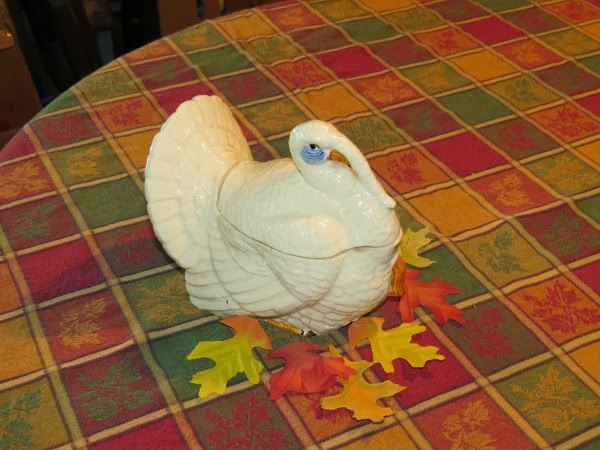 This turkey shaped candy dish was always part of our fall and Christmas holidays as a child. It was often filled with ribbon candy. A long time ago the dish broke into about 20 pieces. I couldn't bear to throw it away, but packed it in a box. I found it a couple of months ago. This week, with the help of crazy glue, I have restored it to usefulness. Sure, if you look closely it's covered with break lines. I don't care. I'm glad to have it back on my table. If you would like to know more about how that table came to be so clean and good looking in the house of this piggy person, you can read Beating a Horrible Housekeeper into Cleaning Up the Mess. You might find it amusing. Since I'm usually late, I decided to be early this time. Only because the sky was a day early. Tomorrow is the official end of summer. There are so many things to say goodbye to... Since I like all the seasons I rarely bother; it's always hello to the next one. But this picture (snapped through a dirty windshield at a stop light), made us chuckle today. What do you think? 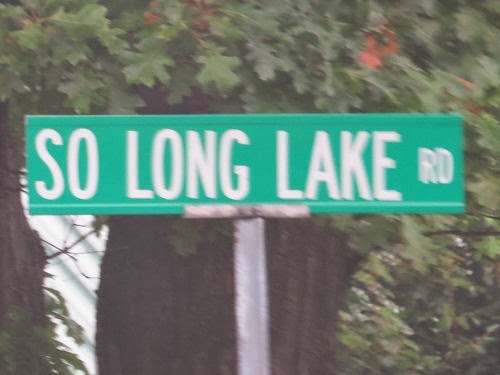 Someone ordered the sign for South Long Lake Road, and instead gave all who wait at that corner to enter the highway and head home a poignant reminder that the vacation is over? And then there's the sky. It has been raining all day, cool and mostly gentle with occasional cloudbursts. Very fall-like. 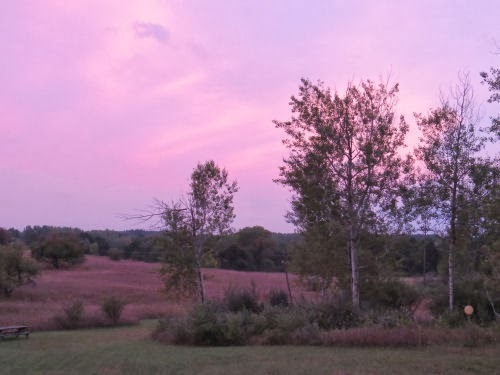 But we get one more pastel sky- more a color of spring than harvest. 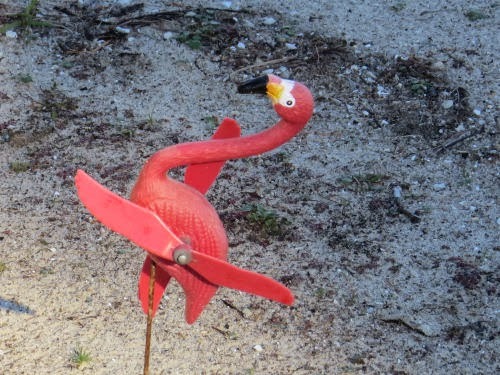 I'll add this to "Moods of My Backyard." Headed for work in a couple of hours, but tomorrow morning I have no activities I have to get up for. I'm really looking forward to that! Hope you have a wonderful last-day-of-summer Saturday! I was going to give you a nice succinct identification guide to the beautiful specimen tree in someone's yard. Right. Instead I'm going to confuse us all. 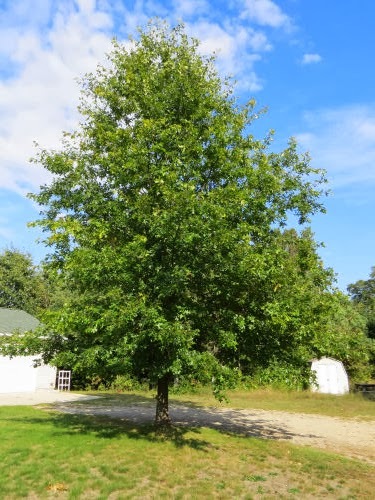 My first guess was scarlet oak because it's been planted, and they are noted for their bright red fall leaves, a great ornamental. 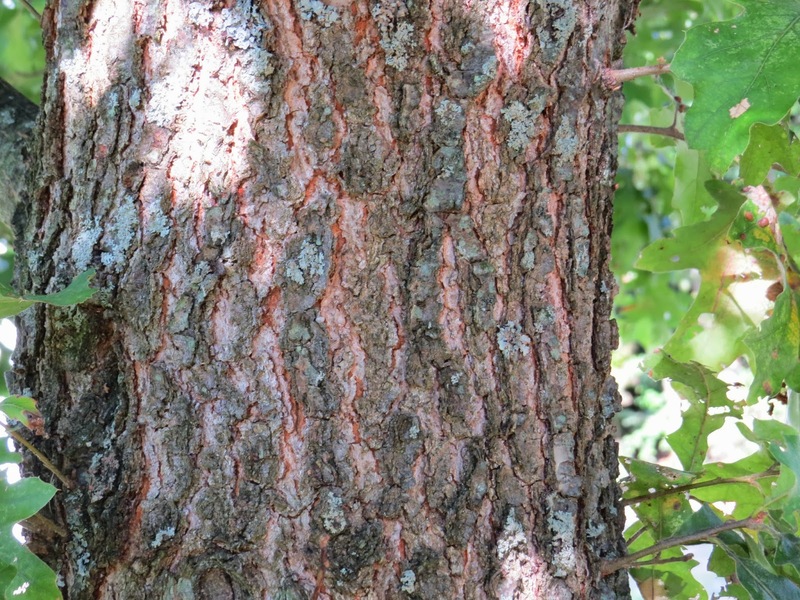 My second guess was pin oak. Then I got out the books. 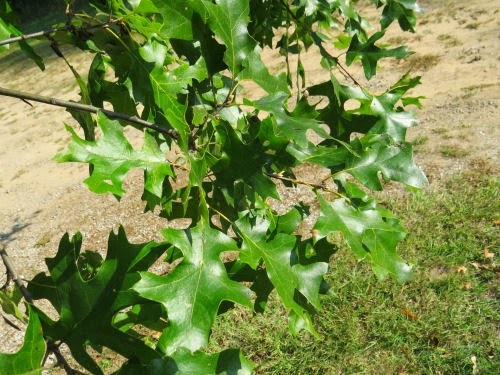 Scarlet oak have a round crown, pin oak a pointed one. OK, pin oak. Then I looked at the leaves. Well, just to not overlook the easy part, it's in the red oak group because the lobes are pointed, not rounded. That doesn't narrow the choices much. There's a lot of leaf variation on every tree. 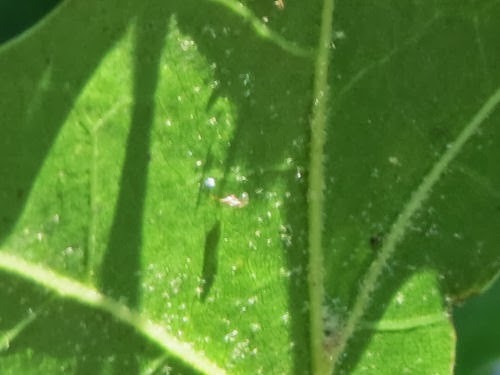 First we have these very narrow leaves with 7 lobes, and deep sinuses that don't have parallel sides (like an open C, not a U). And the upper edge of each lobe is about at right angles to the midvein. That says pin oak. Now look at these leaves. 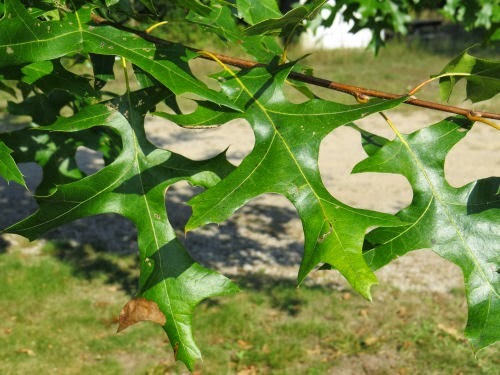 The oddly irregular lobes with multiple bristles says scarlet oak. So does the broad squarish leaf you see in this picture. 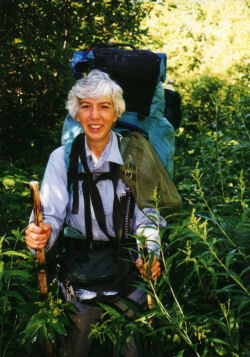 This picture was taken to show the immature bark. It doesn't look like any of the pictures. 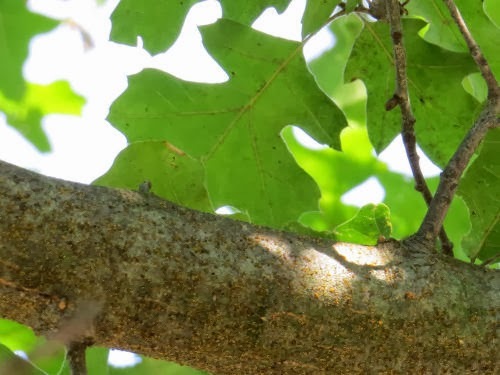 However, if I'd wanted to break a twig and check for yellow inner bark that would have said black oak too (but I didn't know that when I was at the tree). The mature bark is a bit of a toss-up too. It looks most like the pin oak in my book. It doesn't look like the black oak bark I see in the woods. Then there's the fruit, the acorn. This does not look at all like pin oak- the scales are too loose and fringy, and the cap covers too much of the nut. 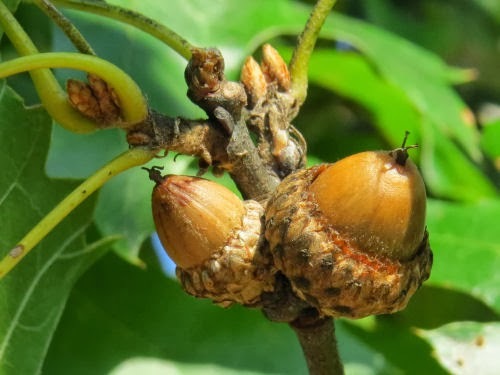 It looks very much like the black oak, and slightly less like the scarlet oak. 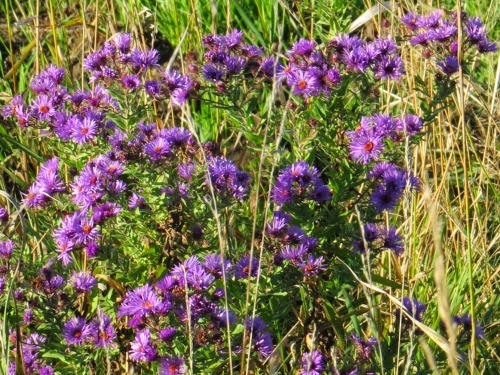 Possibly some hybrid cultivar. Possibly I'm just not very good at this oak ID stuff. So there you have it. It's an ornamental oak tree. You probably could have gotten that far without any instruction from me at all! 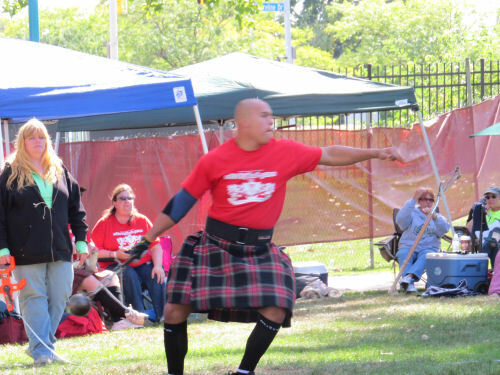 I promised you pictures of the Highland Games from Saturday, so I'll produce them tonight. And there are too many pictures, but it needs them all to give you a sense of even the three events we saw. 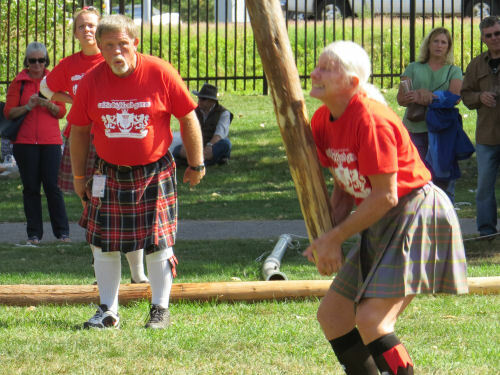 We watched parts of the stone shot put, the light weight for distance toss, and the caber (log) toss. Here's the correct form for holding the stone. I was delighted to see there was also a women's division! I think they used the same stones as the men for this event. 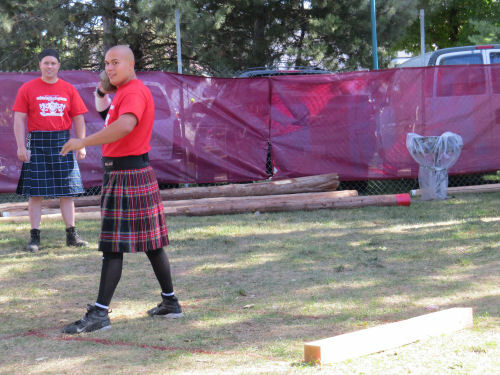 As you can see, Americans wear compression shorts under their kilts (so did the guys). This fellow came in either first or second. 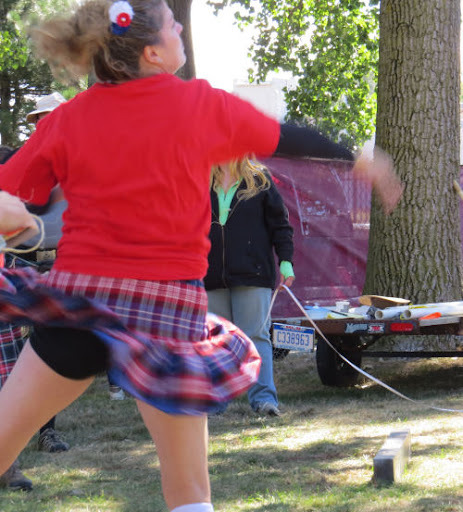 It was hard to keep track of the announcements, but both threw over 40 feet! Having always been a Yul Brenner fan, I liked his style (smirk). We were there for the beginning of the light weight for distance toss, so got to hear the explanation. 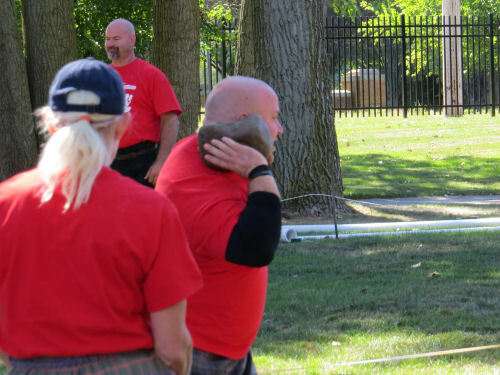 A Scottish "stone" is actually 14 pounds, and these weights are 4 stone, or 56 pounds. That's for the "real" men. 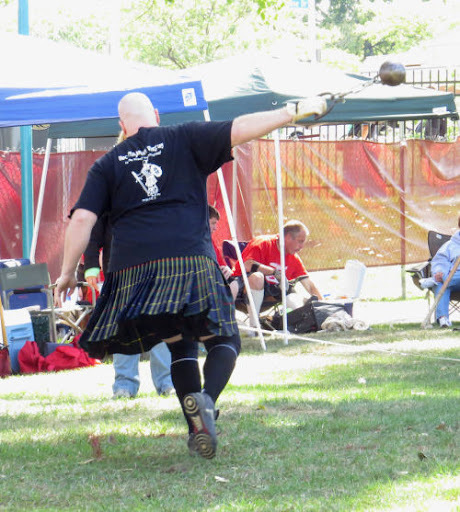 The masters (over 50) get to throw 3 stone, or 42 pounds. The women throw 1 stone. The weights are fastened to a chain because the originals were used as balance weights for bags of grain, and the sport probably began by some guy saying, "I can throw that farther than you can." You can see the weight on a chain in his right hand. They moved much farther away from the audience for this event! Here's another guy on his way around. They do 1 1/4 turns before releasing the weight. 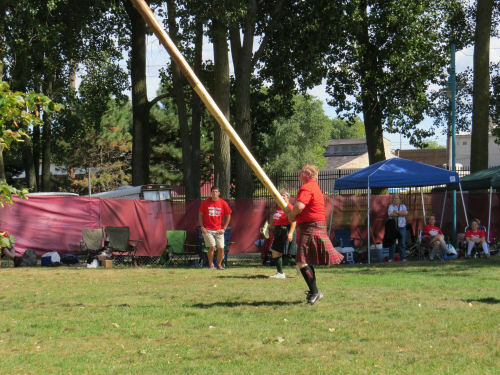 After another concert, we came back and saw part of the caber toss. Again, the women's logs were lighter, but we didn't catch the beginning, so don't know the actual weights. 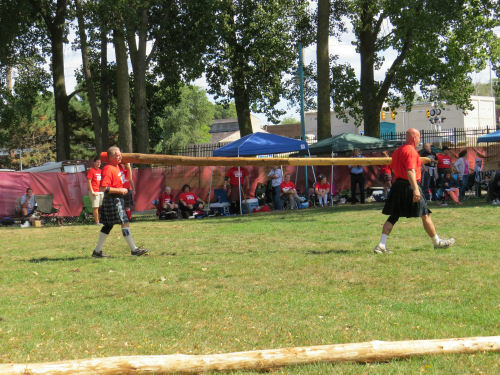 In either case, it took two people to carry the logs to the contestant and get them set up for the lifting. The idea was to lift, get it balanced slightly in front of you, run with it, then heave-ho! It's supposed to flip over, so the end you were holding ends up farther away than the top end. This guy got his to flip correctly. You can see he had a good angle, which gave him good momentum. This was right at the end of the run, just as he was beginning to flip the log. And the girls got in the act too! This gal was "older" and smaller than the others, but she did herself proud. There's no doubt she has muscles of iron. But none of the women were able to flip the log. I'll tell you a secret. I only saw one man (the one above) do it either. I think there is a LOT of technique in this event, as well as brute strength. And being tall helps too. How do you like the expression on the other guy's face?